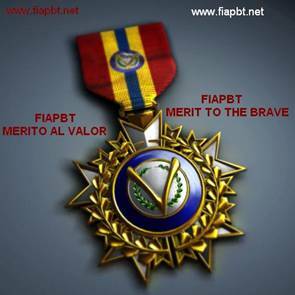 FIAPBT and IADCRO RECOGNITION, granted the medal by the brave merit to “ANGEL”, a AMERICAN PIT BULL TERRIER CANINE HERO, which was lost and Saves a Woman and her Child From Attacker with violence. 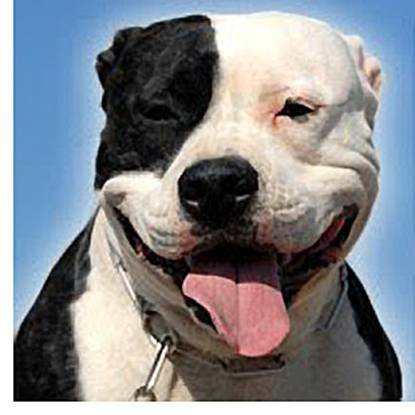 An American Pit Bull Terrier (PIT BULL) lost, Saves Woman and her Child From Attacker with violence. The dog, which authorities think is lost, successfully thwarted a robbery attack on a mother and her 2-year-old son, who were held at knifepoint Monday afternoon. “I don’t know what his [the thief's] intentions were — I don’t know why he did it, but I’m glad that — we call him Angel — I’m glad that Angel showed up because I don’t know what would have happened,” Angela told NBC2 News. This doggie called Angel, is criminalized by the BSL and by the Law PPP in Spain, like it does with thousands and thousands of good and noble dogs pertaining to eight wonderful breed dogs along with its responsible proprietors. All the fans to the American Pit Bull Terrier of any place and the lovers of the animal in general, we give to you THOUSANDS THANKS “ANGEL”, never we will forget to you.